Patriotic whoopee pies from the Blueberry Council. 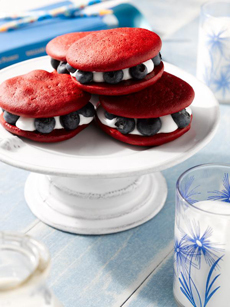 The Blueberry Council wants to make it easy for you to create red, white and blue food for July 4th. The recipe is simple: a box of red velvet cake mix, a jar of Marshmallow Fluff (or other marshmallow creme, or homemade) and fresh blueberries. Small scoops of red (strawberry), white (vanilla) and blue (blueberry or boysenberry). Alternative: Soften vanilla ice cream on the counter and stir in red and blue berries. Return to the freezer until ready to serve. 2. COMBINE the cake mix, flour, water, oil and eggs in a large bowl. Beat until smooth with an electric mixer at medium speed, 2-3 minutes. 3. SCOOP the batter by rounded tablespoons onto the prepared baking sheets, 2 inches apart. Bake until puffed, 8-10 minutes. 4. LET cool 2 minutes on the baking sheets. Then, use a spatula to remove the cookies to wire racks and cool completely. 5. SPREAD 1½ teaspoons of the marshmallow creme onto the flat side of each cookie, using a small spatula or knife. Divide the blueberries onto the perimeter of the marshmallow on half of the cookies. Top with the remaining cookies to make 24 cookie sandwiches. 6. SERVE immediately or store chilled in an airtight container, layered between sheets of waxed paper or parchment. The history of whoopie pies. The history of Marshmallow Fluff and a recipe for homemade marshmallow creme.